Is Trump trying to build momentum with black America? The president claims his popularity with African-Americans is improving. His policies and public statements, experts say, tell a different story. In the last two weeks, President Donald Trump has issued pardons or commutations for two black Americans: Alice Marie Johnson, 63, whose life sentence was commuted, and Jack Johnson, the legendary boxer who received a posthumous pardon. Alice Johnson had been serving a life sentence for a nonviolent drug offense. More than a century ago, Jack Johnson, the first black heavyweight champion, was convicted of a crime due to what many believe was racially motivated retaliation against him. These actions, along with a more vocal push from Trump promoting what he calls his "success" at gaining black support, are raising questions about whether he is trying to gain favor among African-Americans across the country, and whether he can succeed in that goal. Dr. Zebulon Miletsky, assistant professor of Africana studies at Stony Brook University in New York, told NBC News that Trump is using the pardons to send a message to the black community. Gaining actual trust in the black community will take much more, Miletsky said. "Trump and those folks are going to have to get to know African-American history, and not by giving token things that they think will make a difference." Alice Johnson is one of thousands who are serving life without parole for a nonviolent offense. Last week, Trump met with Kim Kardashian West — the reality TV star and wife of hip-hop mogul and Trump supporter Kanye West — to talk prison reform and sentencing. At the meeting, Kardashian West advocated a pardon for Alice Johnson. Trump reportedly told the Wests that they were boosting his popularity among African-American voters. “Kanye West must have some power because you probably saw I doubled my African-American poll numbers. We went from 11 to 22 in one week,” Trump said on May 4 at the NRA annual conference in Dallas, referring to West’s recent tweet praising him. He cited a recent Reuters poll, although that claim was misleading because of the poll's small sample size. Trump has brought up the record-low black unemployment rate for which he has sought to take credit, even as the racial gap between black and white unemployment remains high. Linda Haywood represented Jack Johnson's family at the White House ceremony that made the pardon official. She said Trump's motivation for clearing Johnson's name doesn't matter. "I have no idea why President Trump did it," she said. "Actually, I'm going to tell you the truth. I don’t give a damn what his motive was. I don't give a hoot in hell." Dr. Elwood Watson, professor of history, African-American studies and gender studies at East Tennessee State University, said Trump made the right decision to pardon the boxer. Watson said she believes the pardon was directed toward former President Barack Obama, because he declined to issue a pardon for Johnson, but also to quell the argument that Trump is a bigot. Some columnists have called pardoning Johnson a direct "jab" at Obama. “Obama should have done it,” Watson said. “When history looks back on him, that will be one of his shortcomings." Alice Johnson's request for clemency was denied by the Department of Justice three times during Obama's presidency. Obama did, however, grant the most commutations of sentences in history during his time in office. Trump has been criticized for his attempts at outreach to black communities during both his campaign and his presidency. His often-repeated line of "What do you have to lose?" drew scorn from members of the Congressional Black Caucus. He received 8 percent of the African-American vote in the 2016 election, which was slightly higher than Mitt Romney's 6 percent in 2012. “By posthumously pardoning (Jack) Johnson, Trump is [at least] able to say that he lived up to a request that Obama was afraid to live up to,” said Dr. G.S. Potter, founder of the Strategic Institute for Intersectional Policy. Potter sees the posthumous pardon as a "political grand slam" for Trump and part of a larger effort to gain black support, even if in small numbers. Several activists interviewed by NBC News expressed concern Trump's pardon of both Alice and Jack Johnson directly clashes with his administration's strict "law and order" approach to policy. Trump ran as a pro-police, tough on crime candidate — a message he's maintained as president. He appointed Jeff Sessions as attorney general, which has led to a reduction in programs aimed at investigating and reforming police departments. Jack Johnson's story wasn't on Trump's radar until actor Sylvester Stallone called him in April and described the boxer's background. 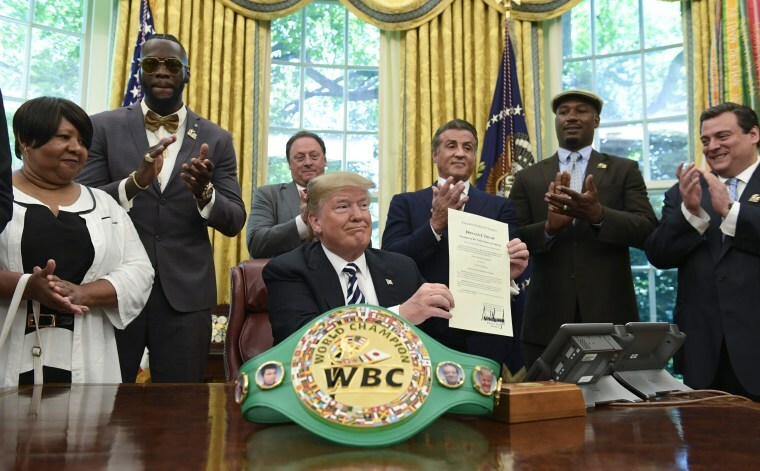 During the White House ceremony this week, Trump was joined by the "Rocky" actor, current heavyweight champion Deontay Wilder and boxing Hall of Famer Lennox Lewis. “I don’t think he has any deep convictions except that Stallone is his friend," said Kamau Franklin, an attorney and activist in Atlanta, who added that the pardon could improve Trump's standing with "the black community without doing anything substantive." “This could be a win for him on social media," Franklin added about Trump's pardons. "He could get his friend Kanye West to tweet it a thousand times."